Some people – perhaps at the current time “many,” since I have so few readers, and most of those are people who know me – know that I make my living primarily as a criminal defense lawyer. That job is a difficult one. It may surprise you to know that lawyers are not well-liked generally in our society (until we need them), and criminal defense lawyers are in many respects the lowliest of the bunch. We, after all, are not seen for what we really are – protectors of your rights, and of the vitality of the United States Constitution – but are rather mostly seen as just a step removed from our over-vilified clients. With rare exceptions, we’re thought of as the criminals who put criminals back on the streets. The sad thing about this – aside from the fact that by protecting our clients, we are actually protecting us all – is that even our clients much of the time do not really like us. Even those who know we’re doing our best can be frustrated when they realize that we are not going to be able to achieve their goals. Those who don’t believe we are doing our best are even worse. Many of the people I defend are actually pretty nice people who just got caught up in something they never intended to be involved in (because we have too many laws; too many things are illegal which should not be; and prosecutors overcharge even when someone has committed a crime). But, inevitably, some of them are not, at heart, nice people. After all, we don’t just get to defend innocent people wrongly charged with crimes. Not if we’re going to keep our offices open. So it happened that after 25 years of pretty much never taking an actual vacation, I found myself seriously in need of escape. I’m not going to go into the whys and wherefores; this post is about what I did: how I escaped, and where I went. Freedom is being guided by a mood, not a map. I didn’t go quite as far as this. When I “planned” my vacation, I did not actually plan. In fact, I didn’t even pack until the day I left, and I had no idea where I was going, except “north.” I wanted to get away from California’s drought, and see something green, wet, and, I hoped, interesting to photograph. But I did occasionally rely on Siri – when she wasn’t on vacation herself – to help me get to locations that I thought might be interesting, based on things people told me, or Internet research that I did along the way. The first day, I left my house about two in the afternoon, and just headed north. Although I’d been saying for weeks that part of my nebulous plan was to photograph along the coast, driving up Highway 1, I ended up taking 99 part of the way north, then hooking up with Interstate 5 to see how far I could get. At the time, I thought I’d go up just north of California, and loop back along the coast. Instead, I made it to about three hours south of Portland that first day. After surviving a vicious 90-second snow storm over a high pass that almost deposited some snow on the ground, I stayed at a “QuickStop Hotel,” which I doubt I’ll ever really want to do again. I worried for at least a day after that I might have picked up some hair-loving critters that I didn’t want. (It turns out I was okay.) The next morning, I headed for Portland. To be fair, I didn’t see much of it. As I got into the city, the traffic struck me as being worse than any in San Francisco, or LA. (I would, days later, learn this was totally wrong, what with some new construction happening along the Golden Gate to Bay Bridge route.) 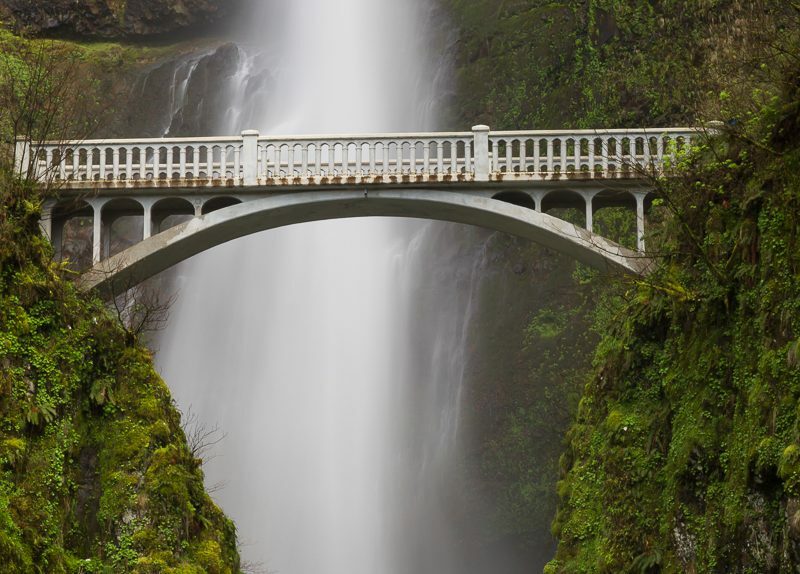 I’d heard about Multnomah Falls, up along the Columbia River Gorge, and decided to head east. One benefit to my job is that it has taught me a little patience (driving in Portland notwithstanding). A private-practice criminal defense lawyer’s day is filled with periods of driving, punctuated by periods of waiting in courtrooms for cases to be called, and a few seconds to minutes to complete the hearing before getting back in the car, and driving to the next wait. When I arrived at Multnomah Falls, I learned that it is an extremely popular attraction. At any given point in time, the place is crawling with dozens, if not at least a hundred, people. All are trying to either get photos of themselves with the falls in the background, or are moving through the area to hike farther up. I found myself a good location to frame the image you see above. And stood there. About once every forty minutes or so, the bridge would completely clear of people for anywhere from a couple of seconds, to maybe (at most) ten seconds. During those times, I would snap whatever pictures I could get. I stood vigilant the entire three hours, with a rain-resistant fabric over the camera. (The mist from the falls builds up!) I’d jerk the rain cover off when I though the bridge was about to clear, and, if it did clear, I’d snap one – two or three if I got lucky – photographs of the empty bridge. I was using a Neutral Density filter, adjustable to 8 stops, and tried capturing various exposures with hopes I’d capture the water just so. When people moved onto the bridge again, I’d put a new setting into the camera, and wait. The Multnomah Falls image above was shot with a Canon EF85mm f/1.2L lens on my Canon 5D Mark III, at ISO 100, 2.0 seconds, f/16. I don’t recall how much I stopped it down with the ND filter, but it was geared to get the two-seconds exposure. In the end, I felt this gave the right amount of softness to the water flow. In the interest of trying to keep my posts short, I’m breaking the vacation story up into a few posts. I will possibly interject other articles between them, but will tell the story over the next week, or two. This will give you something to look forward to, and me a reason to start blogging more regularly.